Kansas farmer Gail Fuller began experimenting with no-till farming on and off during the 1980s. Early on, Gail’s early experiments with no-till farming did not yield the results he wanted as soil erosion on his farm continued over the next decade. 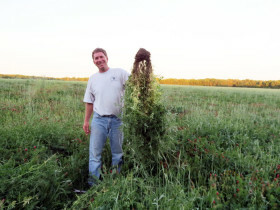 Gail Fuller shows the biomass he can grow with his cover crop seeding. late 1990s where he learned about using cover crops, but found he wasn’t fully committed to the idea. After a severe drought in 2000, the first things he eliminated were the cover crops. The drought continued for the next few years while yields slowly declined and erosion worsened. “That’s when it dawned on me that we’d actually been headed the right direction with the cover crops. Instead of taking things out of rotation, we needed to be adding things into it.” He learned that by changing the crop rotations more frequently, the soil would become more enriched with carbon and the erosion would improve. So in 2003-2004, Gail went back into cover cropping. “Only this time, instead of using a monoculture we used mixes,” he says. He started with a few plots and quickly realized the opportunity to start grazing which led to him to the decision to trade some corn for cows. “I was scared to death because most of these things we were using as cover crops I’d never heard of before, let alone feeding them to cattle, not knowing what it would do to the cow. But that’s how we got started. From there, it just exploded,” Gail says. He started attending more conferences, listening to people like Dave Morell, Gabe Brown, Neil Dennis, Ken Miller, Doug Peterson, Jim Gerrish and Greg Judy discuss mob grazing and talk about holistic practices. He also took an Introduction to Holistic Management 3-day beginning course through Holistic Management Certified Educator Joshua Dukart. He realized that moving his cows every 2 to 4 weeks wasn’t enough so he began moving them at least daily. Eventually chickens, sheep, pigs and turkeys were added to the operation, resulting in healthier soil and more productive plants. “We didn’t have to add any more acres or plant anything different to bring in the lambs or the chickens. They just eat what the cattle don’t,” he explains. Gail is now building up his cattle herd at a deliberately slower pace this time. The farm converted to a grass finishing operation and its products have captured the interest of restaurants and consumers. He notes that selling to grocery stores may also be in the future. Integrating chickens and sheep into the livestock mix has increased animal production from the cover crop mix and allowed Gail to expand his direct marketing of meat to customers. However, Gail has noticed that Holistic Management ideas have become more recognized in the past few years. “I don’t know exactly what’s driving this, but it’s probably a little bit of many factors. Consumers are becoming more aware of their food, for one,” Gail says. Also, the economics of farming/ranching have gotten to the point where many people in agriculture are searching for ways to stay in business. “The only way they can compete and continue to live on the land is to stack enterprises. They have to find a way to get more dollars out of every acre, with less input. Holistic Management is the only way to do that,” he says. “I’m 50 years old and I don’t know if I’ll see it through to accomplish all my plans, but hopefully my kids have learned from my mistakes. At the same time, I tell them that I hope they fail, because they will learn more from their own mistakes. You have to fail, to know success, and you can’t be afraid of failure. You need to be out there pushing the envelope. This is how we learn,” he says. To read the full In Practice article by Heather Smith Thomas, click here (pages 13-15). Read more about how you can build healthy soil on our Healthy Soils Resource Page.